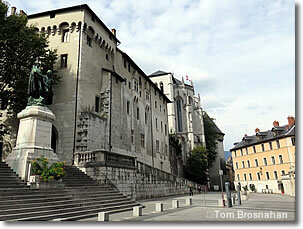 Historical capital of Savoy, Chambéry is a pleasant place to visit for a few hours, a meal, or a day or two. Chambéry is the historical capital of the realm of Savoy (since the 1200s) and is the capital of the French département of Savoie today. Located at a crossroads of roads, rivers and valleys 85 km (53 mi) south of Geneva, 100 km (62 mi) east of Lyon, and 523 kilometres (325 miles) southeast of Paris, Chambéry has always had lots of visitors passing through. If your itinerary takes you there, you'll find a nice Old Town section, some impressive public buildings and museums, a good Office de Tourisme, good train and bus service, even a small airport, and a selection of hotels and other lodgings. Use this handy Hotel Search Box to check room rates, availability, location, and services, to find just the right place to stay.